You can’t call yourself a ranch if you don’t have horses, a barn, and acres of land to ride free. 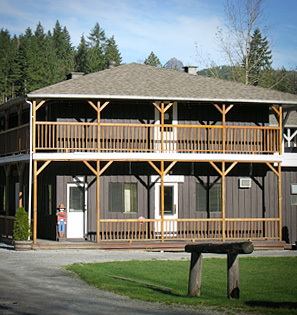 Timberline Ranch is the real deal: located in Maple Ridge, we have 45 horses on 73 beautiful acres, nestled in the foothills of Golden Ears Mountain. We have worked hard over the years to increase and improve our amenities for campers young and old alike. Get a good idea of what to expect before you arrive by viewing our 360-degree virtual tour, or our printable property map. The Lodge – a charming western-style lodge with 18 rooms for guest accommodations (2-4 people per room), a spacious dining room, and a large, open basement with ping pong, air hockey, and foosball tables. Approximately 52 people can sleep in the Lodge. 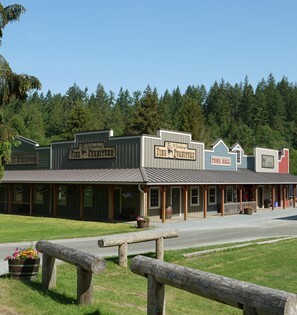 Western Town – an “old west” building with false fronts and covered, wooden boardwalks. Each of the 6 spacious units contains 4 sets of bunk beds and 2 queen beds, to provide sleeping facilities for 10-12 people. Each unit also has its own entry area and bathroom facilities. Approximately 60-72 people can sleep in the Western Town. Poolside Cabins – each of the 9 heated cabins contains 4 sets of bunk beds and one single bed, to provide sleeping facilities for up to 9 people. Eagle’s Nest has an additional single bed, so it has room for 10 people. Each cabin also has its own bathroom facilities. Approximately 82 people can sleep in the poolside cabins. Horseman Inn – our newest “old west” building with false fronts and covered, wooden boardwalks. This building contains 3 cabin units and a 29’x17′ meeting room, which includes a counter with sink as well as an accessible bathroom. Each of the 3 cabin units contains 4 sets of bunk beds and 2 single beds, to provide sleeping facilities for 10 people. Each unit also has its own bathroom facilities. Approximately 30 people can sleep in the Horseman Inn. Town Hall – another “old west” building with false fronts and covered, wooden boardwalks. This building contains a spacious 60’x40′ meeting room, which can be subdivided into 2 units. There are also bathroom facilities, a craft/meeting room, and our General Store. 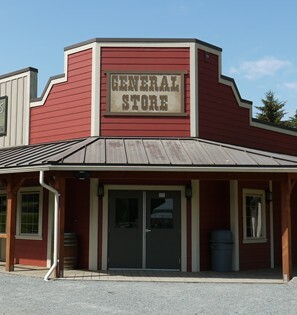 General Store – also known as the ‘Tuck Shop’ during summer camps. If your group schedules time for shopping, you can purchase a variety of items, including: chocolate bars, candy, pop, shirts, and Timberline Ranch souvenirs. Sports Courts – a 60’x70′ paved and fenced area for playing basketball or ball hockey; also an outdoor sand volleyball court located behind (north of) our lodge. Barn – a large, modern barn with indoor riding arena, classroom space, hayloft, and several attached corrals. Campfire Rings – two campfire rings at opposite ends of the property. One area has picnic tables surrounding it, and the other area has tiered bleacher seating to accommodate up to 160 people.